Metastasis is a multistep process involving detachment of cells from the primary tumor, invasion and penetration of the basement membranes of blood vessels, survival in the blood stream, extravasation, and growth of secondary tumors in distant organs (Liotta et al. 1983, 1991; Shirrmacher 1985; Nicolson 1988; Hart and Saini 1992). 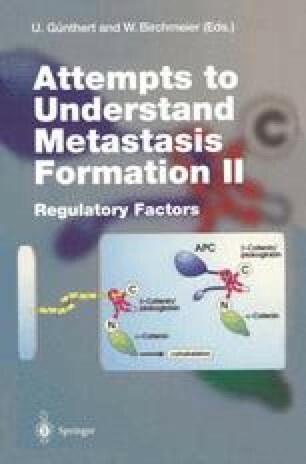 Many proteins have been identified which may play a role in the different stages of tumor progression and metastasis and which distinguish metastatic and nonmetastatic cell populations (Stetler-Stevenson et al 1993). Somatic cell hybridization (Tuck et al. 1991; Ramshaw et al. 1983) and transfection of DNA from metastatic cells into nonmetastatic cells suggested a genetic involvement in the metastatic process (Thorgeirsson et al. 1985; Bernstein and Weinberg 1985).